Supposedly it is November outside. Besides the odd day here and there, did anyone remember to tell the Canadian weather that? Because it has been such a gorgeous autumn! Yes, we saw the lightest dusting of snow for a couple of days, but then we were right back to sitting outside on the patio and wearing no coats outside on the occasional afternoon. Three cheers for being able to turn off the heat in the house! Today I had planned to post a recipe for my favourite holiday cookies that was handed down through the generations. But I just couldn't do it! This fall has been so beautiful, and did you know the local apple orchard is still open with apples on the trees to be picked? Even as I write this post, I can hear someone in my neighborhood mowing their lawn ... in November! All things considered, I figured the holiday cookies could wait a little longer, and this weekend I took to the kitchen to make a harvest inspired recipe after a bit of inspiration a friend shared online in the form of a Tasty video. Essentially, the video shows cinnamon rolls (from a can) being cut thinly and being used as both an upper and lower crust for an apple pie. Intriguing, for sure, except that I really love cinnamon rolls when they are homemade (canned varieties just don't do it for me). Also, as a parent with a busy toddler, cutting a lot of thin rolls, rolling them out to be thinner, and then positioning them into a crust didn't seem like something I wanted to spend my valuable and short amount of "nap time freedom" on. After some recipe testing and much thought, I decided to try making a no-yeast recipe for Cinnamon Roll Apple Cobbler. No waiting for rising, no rolling rolls flat, no canned products, no double crust, delicious apples, and you can make it and bake it for faster delivery to the taste buds. What's not to love? I hope your family enjoys this as much as mine did. What's your favourite fall dessert? Please comment and share below! Grease either a 9X9 glass baking pan or a 1.5 quart casserole dish. For the filling, in a small bowl combine brown sugar and cinnamon to form a mixture. Cut in the butter with a pastry blender and mix until crumbly. Stir in milk to form a soft dough. Lightly knead dough on a lightly floured surface until just combined. Shape dough into a rectangle (approximately 8X12 inches) and roll it out using a rolling pin until it is about 1/4 inch thick. Spread the softened butter over the dough in a thin layer using a butter knife. 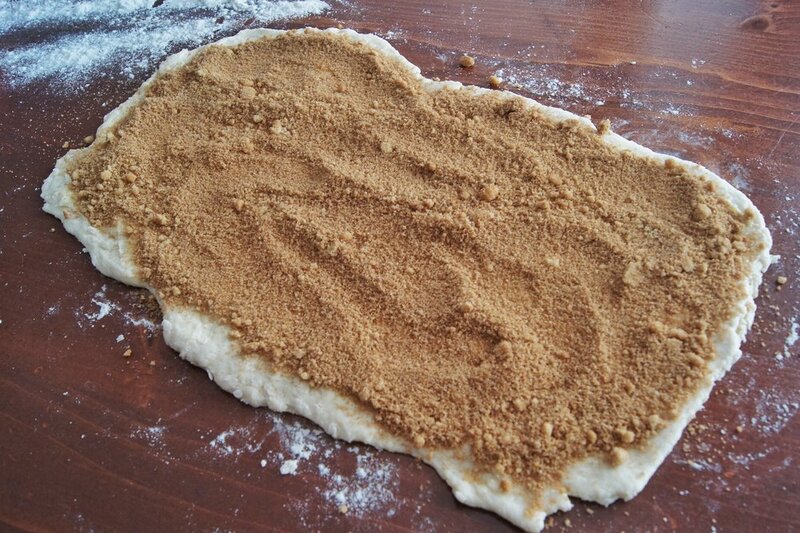 Sprinkle the cinnamon and brown sugar mixture evenly over the rolled out dough. Peel and cut up the apples. Place them into the greased baking dish (either a 9X9 pan or a 1.5 quart casserole dish). Stir the lemon juice and raisins into the cut-up apples. Gently place the cinnamon rolls on top of the apple mixture in the baking pan. Bake for 30-35 minutes until apples are bubbling and cinnamon rolls are thoroughly cooked (check along edges where they meet each other with a knife to ensure they aren't soft and doughy still).